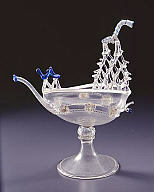 This fanciful rigged sailing vessel is an extremely rare example of sixteenth-century Venetian glassmaking. The delicate little vessel is one of only three in the world that can be securely documented to have been made before the wide-scale manufacture and dissemination of historicized versions at the end of the nineteenth century. The other two examples are located in the British Museum, London, and the Museum of Applied Arts, Prague. Milwaukee Art Museum. Building a Masterpiece: Milwaukee Art Museum. New York: Hudson Hill Press, 2001, p. 64, color illus. Winters, Laurie et al., A Renaissance Treasury: The Flagg Collection of European Decorative Arts and Sculpture. New York: Hudson Hills Press, 1999, p. 74, cat. 27, color illus. p. 74, color detail p. 48. Katalog der Reichhaltigen, nachgelassenen Kunst-Sammlung des Hernn Karl Thewalt in Köln. Cologne, 1903, p. 32, lot 473, illus. no. 473. Recent Acquisitions, Milwaukee Art Museum, May 18–September 10, 1989.